Miltoncontact: Social media for business, where do I start? Social media for business, where do I start? If you’re new to using social media as part of your marketing strategy, the first advice usually given is: Make sure you have a clear social media/marketing strategy for your company before getting started! My objective is to help you take that very first step. Let’s take a look at what other social media marketers have done and think are important. The data comes from the Social Media Marketing Industry Report for 2013 and is based on responses from 3025 participants. (I thoroughly recommend getting the full free report from www.socialmediaexaminer.com). The chart below gives the percentage of positive responses on nine different benefits. More than three quarters of respondents saw both increased exposure and increased traffic to their sites as the main benefit of social media marketing. Third on the list was the ability to gain marketplace insights. In contrast, only 43% saw an immediate benefit of improved sales. However, this did increase where companies have been marketing by social media for several years or more. The immediate benefits of social media marketing are high visibility and interaction with your customers and being better informed about your market place. 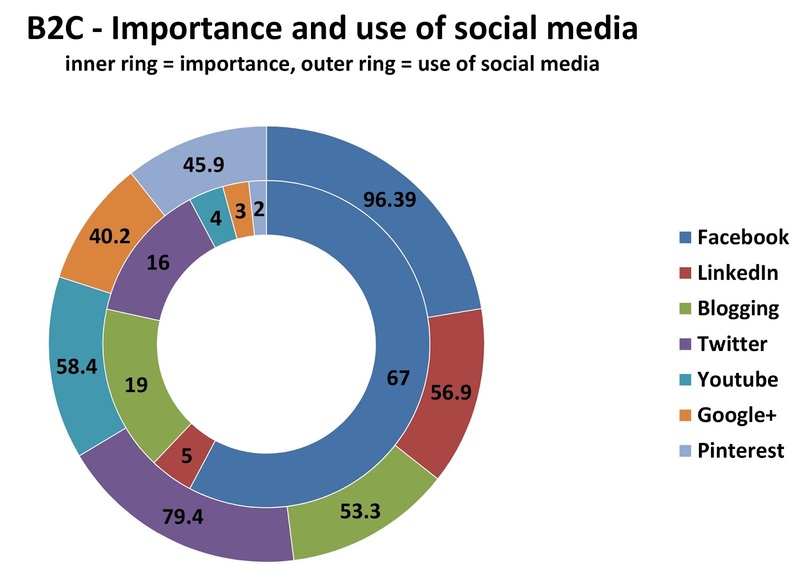 Which social media do companies use? 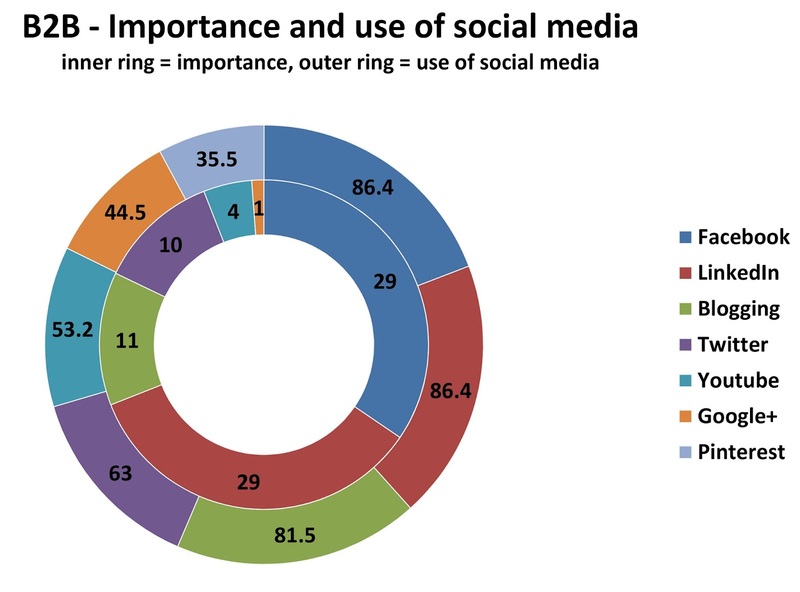 Which is the most important social medium for a company? The answers fall out slightly differently, depending on whether you’re a B2B business or B2C business. B2B Companies tended to use several social media in their marketing strategies. Facebook, LinkedIn and blogging were the most used social media for B2B. Twitter, YouTube and Google plus followed with Pinterest being a new star on the horizon. However the two media that had the greatest importance for B2B marketers in 2013 were Facebook and LinkedIn. For businesses marketing directly to customers, the two main media used were Facebook and Twitter, with LinkedIn, blogging and YouTube roughly equal thirds. Pinterest was also a rising star here. However Facebook was by far the dominant medium of first choice for B2C business marketing at 67%, with blogging and Twitter following with 19 and 16% respectively. The next targets for companies using social media marketing in 2014, were greater use of YouTube, Pinterest and Google plus. Another star on the horizon is the use of podcasting, i.e. using downloadable voice and sound. Choose ONE social medium to start with and join. Set up an interesting personal profile and/or company profile to get started with on your chosen platform. Invite a close circle of business friends and colleagues to like you or follow you or link with you, depending on which social medium you’ve chosen. Use your membership of the social medium to mine it for facts, information and contacts in your business area of interest. Do add your own interesting and relevant contributions to discussions and groups. Persevere on a regular basis until you have a good feel for the medium you’ve chosen. With the information and confidence gained, re-assess and refine your company’s social media marketing strategy. Add other social media to your marketing strategy. Newcomers to social media tend to spend less than five hours a week on their social media marketing. As people become more confident over time, this increases to more than six hours a week. In fact a third of marketing businesses spend more than 11 hours a week on social media marketing. The reality seems to be as with anything, the more effort you put into it, the more you get out of it. I thoroughly recommend getting the full free report from www.socialmediaexaminer.com for more statistics and insights on social media marketing in 2013. Ask friends and business colleagues who are more experienced at social media marketing. See if there is one who is capable and willing to share their experience at a level comfortable to the novice. The Huntingdonshire Business Network members are helpful and knowledgeable in social media. Look for free or paid courses in getting started in social media. If the teacher is great, fantastic! You’ll learn directly from them. If they confound you with long words and lose you pretty quickly, turn to your classmates - at least you’ve gained a self-help group! If you’re based in and around Cambridge, UK, I’m available to help for a small fee :). Good luck with your social media marketing adventure. Let me know how you get on! Thank you a bunch for sharing this with all of us you actually realize what you are talking about! Bookmarked. However, you ought to remember that you are looking at a potentially large audience and must be ready to face the challenges of social media marketing. social media marketing Services: These services embrace of all encircling e-marketing services. As if I mean to say that it includes all services like blogs, forums, constructing online networks, article and video submission and many other important techniques. Good job, Easy enough to understand and you explain a lot in this about Social Media. This is extremely knowledgeable post regarding the social media marketing. Indeed it is very important to promote your service on these platforms as they can give you real visitors to your website. You can also hire the paid twitter, instagram and facebook ads services. Despite the fact that payday credits accompany high annualized financing costs they some of the time are the main wellspring of crisis trade advances for those out need. Much appreciated you particularly to share these connections. Will look at this..
One of those online journals that has left a profound effect on the hearts of the gathering of people. 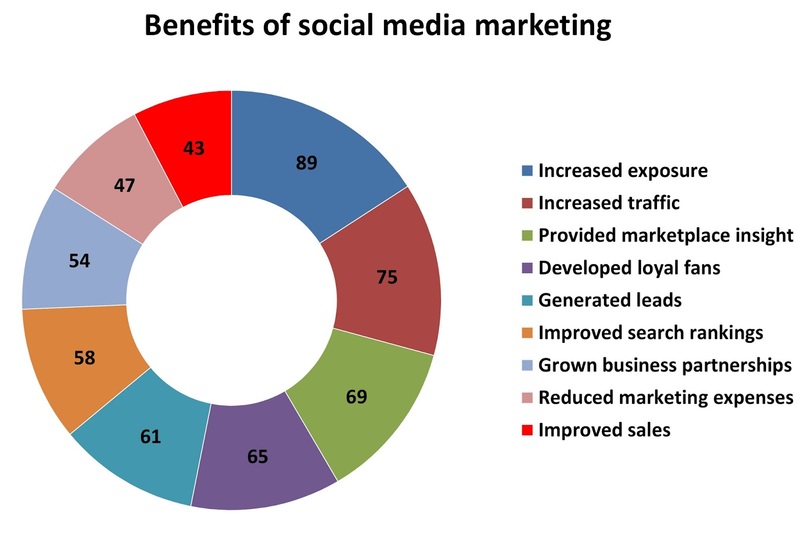 This is amazing share about the benefits of social media marketing. I also believe that SMM has become an integral part of the online marketing strategy. By using the facebook ads services I also have got good success in my blogging career and now I will be using twitter marketing as well. Thanks for sharing the useful information about social media marketing. Now a day social media is the best plateform to build up your business and get more leads. Thank you Sir For providing such awesome information for social media marketing . As a result of many key phrases and phrases have stiff competitors for prime search rankings, you have to to complement your natural search engine marketing efforts with pay-per-click promoting. Getting established with pay-per-click promoting campaigns generally is a little daunting, however with slightly time, effort and instruction, that too could be achieved in-house, or for an inexpensive price by way of an out of doors digital advertising company. If you have any inquiry on region basis marketing like Top Advertising Agency in Syria then please visit our website for more deatails. If you’re looking to Buy Instagram Follower then you’ve definitely lucked out by landing on smmworkshop.com. ﻿Article is helpful but, Digital Marketing Course is the only option for students, professionals, marketers who want to build their career in Digital Marketing. I am hoping the same best work from you in the future as well. In fact your creative writing abilities has inspired me to start my own BlogEngine blog now. Nice blog, thanks for sharing the information. I will come to look for update. Keep up the good work. click here right now for social media marketing importance. WiFi Router Security Tips Generally, the home-based internet router renders a huge number of security features to all the users. There are several other features that you might haven’t used until now. Based on the age of your router, It delivers more or less security-related features to all the users. social media is the next very big thing for your site promotion, since everyone is into social media these days, i promote my website Oneplus Service Center in Chennai a lot in social media like facebook twitter and google plus. Hello there, I do think your website could be having internet browser compatibility problems. When I look at your web site in Safari, it looks fine however, if opening in Internet Explorer, it has some overlapping issues. I merely wanted to provide you with a quick heads up! Apart from that, wonderful website! Hello! I could have sworn I’ve visited this site before but after browsing through many of the articles I realized it’s new to me. Anyhow, I’m certainly happy I came across it and I’ll be book-marking it and checking back often! manage their business Facebook Fan Pages? fast becoming one of the hottest employment trends in the world. Try to learn how to create a fan page, how to add fans, how to target specific folks, how to promote events, how to drive instant traffic to a specific site. Very informative post with great piece of information. Thanks for taking time to share this with us. Waiting for your future write-ups. Social Media is pure love, get instant followers for IG and boom your social presense. Roman infant death in Godmanchester.